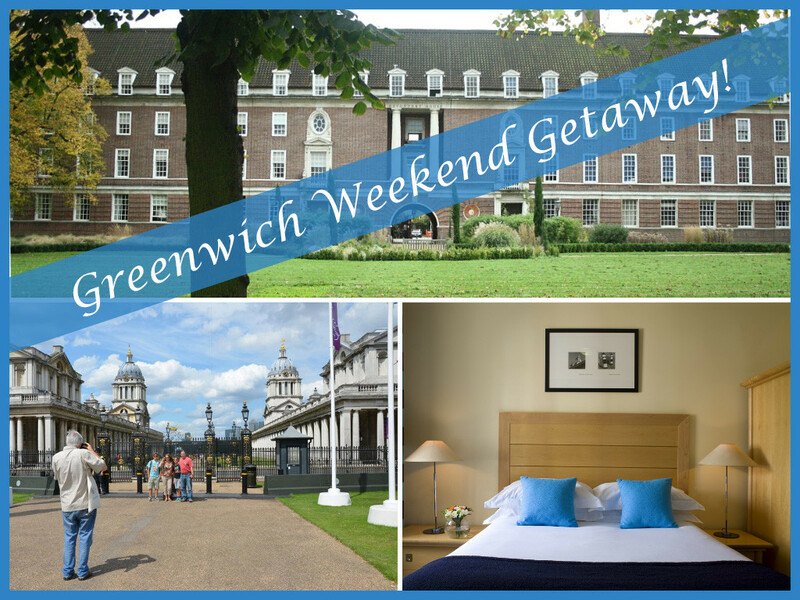 Brand New: The Greenwich Weekend Getaway Package! Here at Greenwich Royal Tours, we have been working for some time on just this sort of package. We wanted a hotel package that gave visitors 2 nights here in gorgeous Greenwich. Since the 2012 London Olympics, more and more people have been discovering all that maritime Greenwich has to offer: the history, the culture, the restaurants and the shopping as well! For instance, the old Greenwich Market just gets better and better with its vintage clothing, art galleries and brilliant street food. Our city break package had to be not just with any ordinary hotel – but somewhere to be spoiled like the boutique Devonport House Hotel with its amazing location right in the heart of Greenwich. Our guests enjoy their double room ( as pictured ) whether or not they are a single or a couple. And the package includes full breakfasts for both mornings. In addition, guests come on our top-rated ( see TRIPADVISOR ) ” Best of Greenwich Day Tour ” which includes all the major venues in Greenwich including: teaclipper Cutty Sark, Greenwich Royal Observatory, National Maritime Museum, Queen’s House and the Old Royal Naval College. Tour includes all admission fees as well as a lovey pub lunch on the River Thames. Yes, EVERYTHING is included in our GREENWICH WEEKEND GETAWAY! Here is the best part – our discounted price. Plan on booking early in order to avoid disappointment! The Guardian’s “50 best views in England” (taken from Simon Jenkins’ recent book) was published recently and unsurprisingly, Greenwich was among them. The view in question of course, is that seen from atop the hill at the Greenwich Royal Observatory looking north towards the River Thames. We see immediately below us Queen’s House, the Italian-style villa created by the multitalented Inigo Jones in the early 17th Century. Today, the House serves as the art gallery for Royal Museums Greenwich, containing paintings of the James Cook voyages as well as Canaletto’s famous view of Greenwich, painted from the Isle of Dogs side of the river. Framing everything are the iconic twin domes of the Royal Hospital for Seamen, designed by Sir Christopher Wren . Queen Mary had always wanted a hospital for disabled seamen comparable to that for the army at Royal Hospital Chelsea. Following her untimely death, her husband King William of Orange commissioned Wren (who had experience two decades earlier in Greenwich designing the Observatory for Charles II) in 1695. A key stipulation of the King was that in no way was the “royal view” from Queens House to the river to be obstructed. And it is from this advice from his client, that undoubtedly motivated Wren and his assistant Hawksmoor to come up with their elegant twin dome solution that we now enjoy. Indeed the architectural result is, as Simon Jenkins so rightly puts it, nothing less than “sheer class”. And yet London has always progressed with a mix of the old with the new. On the wastelands of the decaying Docklands, it was a Canadian developer ( the Bronfmans from Toronto ) who built Canary Wharf from scratch, in the early 90’s. The name itself comes from the fact that it was at the old Canary Wharf, where ships from the Canary Islands regularly unloaded their fresh fruit and vegetables for Londoners. Indeed, one might say that it is this very juxtaposition of the new with the traditional, that makes the view of Greenwich today – truly sensational! Teaclipper Cutty Sark was built by Jock “White Hat” Willis in Dumbarton, Scotland in 1869. He came from a ship-owning family and he wanted a fast clipper to carry tea from China to Britain where tea was a valuable commodity. When it was time to name his new ship, he turned to a poet that he along with many Scots had long admired – Robbie Burns. Burns, unofficial poet laureate for all Scots, had written a poem titled “Tam O’Shanter” in 1791. The poem tells the story of Tam, a hard-working and hard-drinking Scottish lowlands farmer who had ridden his favourite mare Meg into his village for a drink (or two) after a hard days work on the farm. As dusk was falling, he started to head home but while passing the local church (or kirk to Scots) and the adjacent graveyard, Tam spies a beautiful witch dancing around an open fire. She wears nothing but a “sark” which is old Norse and Gaelic for a chemise or petticoat. Her name was Nannie Dee and she had apparently been given the sark while still a child, hence the expression “cutty” for short. And so “cutty sark” meaning short petticoat. At one point, mesmerized by the scantilly clad witch, Tam cries out: “Weel done, cutty-sark”! At which point, Nannie along with her sister witches all begin to chase poor Tam. Ah, but that is as they say – another story! Greenwich walking tours – what to wear to be prepared! already booked, often ask us: what do we wear and/or do we bring an umbrella? An important thing to remember is that although our tours are classed as walking tours, the longest walk that we do is up to the Greenwich Royal Observatory which takes about 15 minutes. And so some walking is of course part of what we do, but the vast majority of our time is spent indoors at one of the venues here in beautiful Greenwich. These include the teaclipper Cutty Sark – now reopened after a £50 M. restoration, the Old Royal Naval College, the National maritime museum as well as the Observatory. Our ” Best of Greenwich ” Day Tour also includes the delightful Queen’s House, designed by Inigo Jones. Dress for the occasion as they say – and in this instance, that would be for comfort. The famously changeable weather here in London means that it cannot hurt to bring along a sweater if it is Spring or Fall – just in case. A warm, sunny day means cottons and perhaps even shorts as well. However, rain is always a possibility in London, even in the summer time and so if it looks like rain is a possibility on tour day, do bring along an umbrella just in case. Again, the good news is that most of our time is spent indoors, but simple precautions are a good idea. more on food on our tour ( eg. pub lunch on the day tour ), informative testimonials from tour guests as well as news about brand new tours planned for the 2013 season. Also, our new YOUTUBE video is expected out next month and so hope to have that for you as well. Until then, as we say here at Greenwich Royal Tours: KEEP CALM AND CARRY ON WALKING!